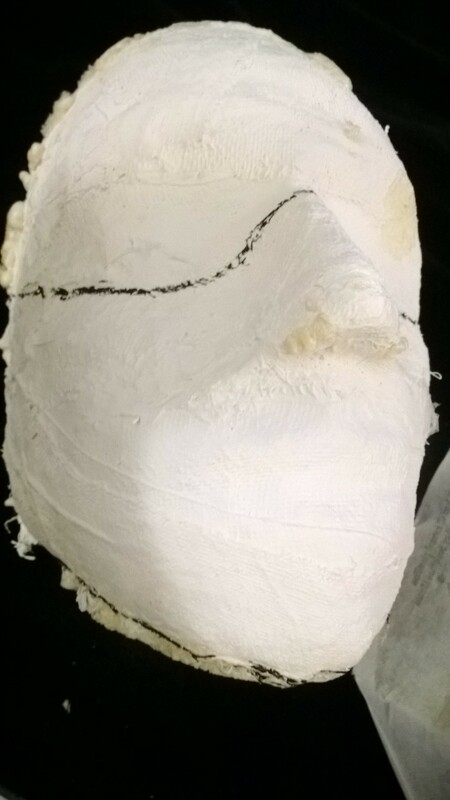 1) I took a sharpie to draw on the plaster face mold. You don’t need to do this if you’re doing a full face mask, but if you’re doing a half mask of some sort like I am, you probably want to mark where it will sit on your face. 2) Then I cut into the clay with a knife. I found that using smaller pieces and sort of kneading them with my hands a bit worked best. So basically cutting into the rectangular block by about 1/8 of an inch at a time. 3) I found a picture on the internet of the Vargulf transformation scene and used that as reference. Of course I had an idea of what a wolf face coming out of my face would look like, but I wanted to try to match what the jaw line was like from the scene in the show. 4) Next, I started laying the foundation for the mask. I covered the cheeks first because they were the flattest, easiest parts. Then I moved on to the snout. 5) Obviously the snout needed to be built up, as the whole look is quite three dimensional. I started layering the pieces and building up the snout, while still keeping in mind the shape of my nose and lips sitting under it. I built out the nose and open mouth. 6) Then I realized I would need to do the details of the mouth, because once I put in teeth, I wouldn’t want to stick my fingers back in there and be messing around with it. So here is where I got out “tools.” Those are heavy quotes around tools because truly what I used was plasticware. I would definitely recommend buying clay sculpting tools if this is something you plan on doing regularly. I used a plastic knife to do ridges in the roof of the mouth. Since I had it out, I also brushed it on the sides and to create a “fur” effect and put lines around the parts of the snout and mouth I thought would be wrinkled from snarling. 7) Next, I placed in a tongue and teeth. I knew that the teeth and tongue had to survive the silicone mold phase and be identifiable enough to make sense in the plastic stage. This is why I affixed everything with a little extra clay. So, for example, behind the line of front teeth, I put essentially a retainer of clay to keep them from breaking off. The tongue was held down/molded in as well. 8) I was going for a snarly, wild look. I didn’t want it to be perfect because to me the Vargulf isn’t perfect. That’s why I didn’t worry about dimples in the clay or creating too much symmetry. In my mind, the Vargulf is insane, so it doesn’t need to look super pristine. 9) Here is the finished product for the clay mold! Now it is ready for silicone! This entry was posted in Conventions, Cosplay, TV/Movies and tagged convention, Cosplay, Hemlock Grove, long beach comi con, Movies, TV. Bookmark the permalink.